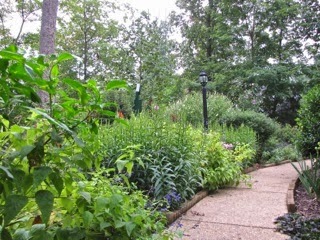 I love this time of year when things are at maturity and the front walkway looks almost like a jungle path. Well, I have a great imagination, eh? You would think that green was my favorite color, but it isn't. I don't know that I have anything green in my closet, but when it comes to the outdoors, I just crave it! That's what makes winter so hard. However, this year, I have determined and already begun to ask Abba Father to show me the beauty of winter. Show me what His purpose for winter is. The Bible talks about seasons so God must have made them ... even though I have always pictured the Garden of Eden as lush and green all year long just like a rain forest. Have you heard that you can convert/recycle throw-away plastics into oil? They do this in large plants, but a Japanese inventor, Akinori Ito, has built a tabletop machine that can be transported by car or plane. It's called the Blest Machine. Pretty fascinating ... be sure to read this post and watch the video: Machine Converts Plastics to Oil. 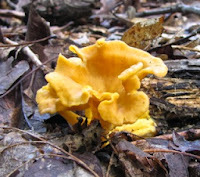 I spent some time in the backyard last month photographing fungi. 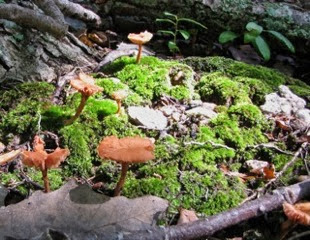 On trees, on the ground and even in moss-covered areas. 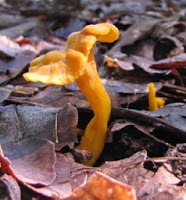 This little orange mushroom was one of my favorites as was the yellow curled one. 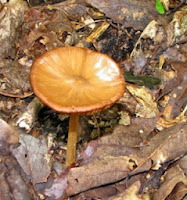 The little brown one actually had a sheen to it and it was like a bowl, so I named it a Bug Bath Mushroom. Surely it served that function out there on the forest floor. It wasn't very large but a small bird could get a bit of refreshment from it right after a rain fills it up. View more mushroom photos from this year's garden album. While I was in Costa Rica four years ago, rambling through the rainforest at La Selva Biological Station, I came across a trio of students from Chapel Hill that were studying Dung Beetles. I had never heard of the bug before and was rather fascinated by their dedication to know more about such a bug that lived its life to eat poop. They clean up what animals leave behind so they are a blessing. 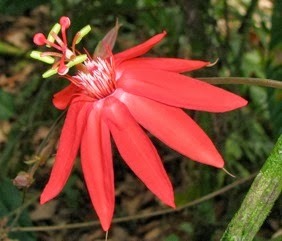 I recently came across a video (2-1/2 minutes) from National Geographic about these critters. They actually push poop balls around by standing on their front legs and guiding the ball running backwards with their back legs. Quite a novelty ... but the last clip in the video shows them also having a whimsical view of life as one dung beetle rolls a poop ball to the edge of a cliff and shoves off on it tumbling head over heels as it hits the ground. And to add a bit more science to this critter, I also came across a video (just a minute long) showing they use the Milky Way Galaxy as a map. Doesn't our Father in Heaven have a great sense of humor?! How silly and intelligent can one bug be? We have some beautiful patches of moss growing on our property and it's not always in a north exposure as I had learned as a child. Seems that in Girl Scouts I was taught that to find which direction is north, you look for where moss is growing on a tree and it will be facing north. Maybe on a tree is different than on the ground. Or maybe there are some rebellious species of moss out there. I was fascinated with this little world of its own realizing how much variety and diversity there was in this one small area of a forest. It makes me wonderstruck thinking of what Heaven will be like. Beyond our imaginations or designs. This "moss island" at the southern-facing base of a tree was like a science project that somebody built and put on display. It was so pretty and fresh. Be sure to view the enlarged image! Let your imagination run wild and it seems like a world unto itself just waiting for somebody to enter the scene. We like to build a large brush pile for the wildlife with fallen tree logs, limbs, and when winter comes we'll cut some evergreen branches to place on top. 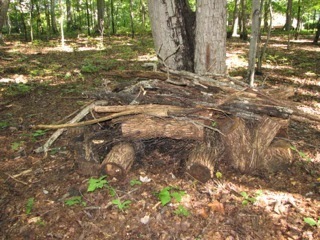 Notice we placed it behind a triple-trunked tree close to the back of our property. 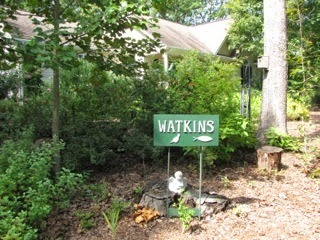 Since we leave the areas under the porches open for wildlife to take refuge, we want this placed in another area of the property. Although it just looks like a pile of wood, it serves a great purpose. So many critters can take refuge in brush piles. Depending on how high off the ground you build it will determine what kinds of wildlife will take refuge. Since we live in a community that has restrictions on brush piles, this is about all we can get away with. You don't want it big enough for predator species to get in it since that's one of the purposes of having a brush pile, besides protection from the winter elements. Birds, lizards, turtles, rabbits, and opossums are some of the things that may spend some time there. Don't you think you could find a spot for a brush pile in your backyard? Here's a few articles with videos that may be of interest: Brush Piles 101 and Build a Brush Pile for Wildlife. 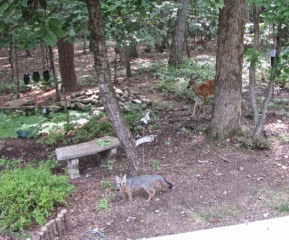 One beautiful day I was working on the screened porch as usual and Mama Love Deer came through the woods with her two fawns. They approached the pond area and before I knew it one of the fawns had made a big splash and the other one had run off from the sound of it. I watched as she licked her legs clean to be sure she hadn't hurt herself since our pond is concrete. I was concerned about those little legs, but all was well. Until ... there was another splash in the pond and another fawn jumped out and shook itself off. I guess the sibling decided it wasn't going to miss the adventure opportunity. The most funny part of it was that Mama didn't even bother to look. She was busy with finding and eating apples that we toss out for the wildlife in the Fall from the orchard. Suddenly the Gray Fox appeared to get an apple and displaced all the squirrels that scattered up the trees. As the fox approached the Mama and came within 4 feet of her, she paused to look up at him and he at her and then they both went back to sniffing the ground. One of those wonderstruck moments again! I went to the deck to get some photos of the deer and fox together although now further apart! The white bottom right corner is the deck rail, so you can see they feel safe in our yard. Be sure to view the enlarged image. I'm so excited that we have the rewards and benefits of all the labor we put into our wildlife habitat to establish it, but most of all for all that God has placed within it to show us every day how much He loves us. Sometimes I feel like I"m in the Garden of Eden and when I look up to see what each noise is, I sometimes expect to see Jesus walking towards me. I often feel His presence but I would love to "see" Him. The mercy that God bestowed on us through grace by giving His Son for our sins is beyond comprehension. But the miracle isn't just what He would DO FOR US, but it was also in what He would BECOME IN US. It's the wonder of God Himself wanting relationship with His Creation. He the vine and we the branches, allowing His life to flow through ours as we become Christ to the hurting and lost souls of this world. One of my gifts from our son was a King James and Amplified Version of the Bible side-by-side. I love to look up original Greek and Hebrew words when I study the Bible and the Amplified version does that for you, although I am always cross-referencing things for accuracy. We are to test all things to be sure we are walking in Truth. I like how the Amplified Bible quotes John 15:5: "I am the Vine; you are the branches. Whoever lives in Me and I in him bears much (abundant) fruit. However, apart from Me [cut off from vital union with Me] you can do nothing." We are all aware of how fruitless our lives can be when we launch out on our own strength for things that God has never told us to do. What we thought would be fulfilling becomes boring and tiresome. When God calls us to a task our hearts will leap with joy while walking and working in His plan and purpose for our lives. Jeremiah 29:11 tells us, "For I know the thoughts that I think toward you, saith the LORD, thoughts of peace, and not of evil, to give you an expected end." We were created to be fulfilled by the will of God for our lives. Have we checked in lately to make sure we're still on His path for our life and not our own? Until next issue .... plan some time in a park nearby to stroll with the Lord. The leaves will soon be changing and the glory of Autumn's colors will be a sight to see that never gets old. We'll be watching the colors change at our place, Bluebird Cove, from a chaise on the screened porch. It's also glorious to watch the sun rise over the colors of the maple and gum trees. Our Abba Daddy is quite an artist! P.S. Know somebody who needs to see something in this newsletter? Forward it to them. Thanks! The photo(s) and article are copyrighted. You may use either of them if you include the following credit and active link back to this website: "© Donna L. Watkins - This article was reprinted with permission from TheNatureInUs.com." 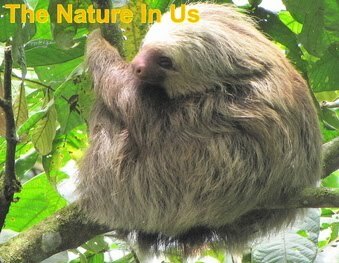 The link is: www.TheNatureInUs.com.